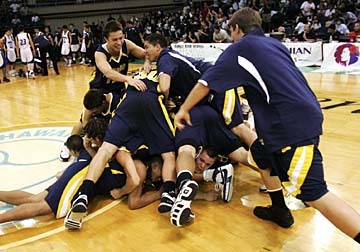 Punahou piled on after piling up another state title. The Buffanblu won their ninth crown, beating Kamehameha-Hawaii. Kamehameha-Hawaii came with the veteran squad, but it was Punahou's youth brigade that came out one play better. Junior Manti Te'o's tip-in with 45 seconds left gave the unseeded Buffanblu a go-ahead basket and the eventual 41-38 win over the Warriors in the final of the Hawaiian Airlines/HHSAA Boys Basketball Division I State Championships last night at Blaisdell Arena. A boisterous crowd of 4,124 saw Punahou capture its ninth state crown, but rarely has one of its titles come after finishing second in the Interscholastic League of Honolulu. Kameron Steinhoff led Punahou (24-4 overall) with 13 points and 12 rebounds, and added two blocks and two steals. Trevor Crabb added 10 points and seven boards, while Dalton Hilliard delivered a big assist for a bucket with 12 seconds left to help the Buffanblu. Hogan Rosehill led KS-Hawaii (24-6) with 20 points and 11 boards. The crown is the first for second-year coach Dan Hale. Trevor Crabb looked to shoot in front of Kamehameha-Hawaii's Colton Collins last night. For one night, at least, youth overcame experience. Junior forward Manti Te'o tipped in a miss by teammate Kameron Steinhoff with 45 seconds left for the go-ahead basket, and unseeded Punahou hung on for a thrilling 41-38 win over Kamehameha-Hawaii last night in the final of the Hawaiian Airlines/HHSAA Boys Basketball Division I State Championships at Blaisdell Arena. "Three of us go up. It was a team effort. I felt the ball. All I felt was leather," said Te'o, who finished with six points. His tip-in left the Big Island champs with enough time to win the game, but standout forward Hogan Rosehill's crosscourt pass sailed over teammate Russell Kackley and out of bounds with 25 seconds left. Junior guard Dalton Hilliard delivered a halfcourt pass to sophomore Henry Cassiday for a layup with 12 seconds left to give the Buffanblu a 41-38 lead. However, that also gave the Warriors a chance to tie the game. "At that point, you gotta take that shot," coach Dan Hale said. "They would've fouled us, so you gotta go." Kamehameha-Hawaii, with four timeouts left, chose to play out the final seconds, and Kealoha Kramer's open 3-point try from the top of the key fell short as time expired. "We got a good look. Kealoha can hit it," Warriors coach Nelson Wong said. "It was just a little short." Kameron Steinhoff had 13 points and 12 rebounds for Punahou, which won its ninth state championship and its first under second-year head coach Dan Hale. 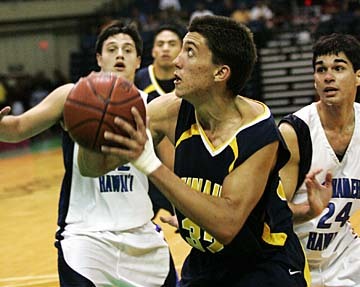 Trevor Crabb added 10 points and seven caroms for Punahou (24-4 overall). Rosehill led KS-Hawaii (24-6) with 20 points and 11 rebounds. "Punahou's a great team. They play great together. They have those tall guys, and that was hard. Hat's off to Punahou," he said. It was an intense chess match between Hale and Wong. Punahou's 1-3-1 zone and fullcourt press defenses forced the visitors to work extra time off the clock. However, the Warriors got their share of easy layups thanks to good passing by an elite corps of seniors that has played together since seventh grade. Kramer's follow shot for a three-point play gave the Warriors a 38-37 lead with 3:39 remaining. Punahou's defense was key, as Steinhoff blocked a shot inside by Kramer, and the 6-foot-4 senior came up with a steal on a pass by Isaiah Kekaualua. That led to the pivotal possession, when Te'o hustled after a missed 8-foot bank shot by Steinhoff for the go-ahead tip-in. "Oh my goodness. Tough isn't the word for them. Thirty-two (Rosehill) was awesome," Te'o said. "He's an offensive threat and we tried to find a way to stop him. Hat's off to him. They came out ready to play." The win was a fitting close to the career of Steinhoff, who recovered from a ruptured spleen to have a stellar senior year. "I feel blessed. It's a great blessing," he said. The Warriors came out strong and had a 19-14 lead midway through the second quarter. However, Punahou closed the half with a 9-0 run, including four points each by Steinhoff and Crabb. Punahou shot 39 percent from the field (16-for-41) and outrebounded the Warriors 31-24, but forced just eight turnovers out of Kamehameha-Hawaii. "We didn't turn it over in the backcourt, and we got great passing for the most part," Wong said. "We had a hard time defending the post. We gave up 3 or 4 inches at both post positions." Key -- fg-a: field goals made-attempted; ft-a: free throws made-attempted; rb: rebounds; pf: personal fould; pts: total points; a: assists; to: turnovers; min: minutes played. 3-point goals -- Punahou 1-7(Toma 1-4, Hilliard 0-1, Steinhoff 0-1, Yoshiyama 0-1),KS-Hawaii 3-11, (Rosehill 2-3, Kekaualua 1-4, Kackley 0-1, Cazimero 0-1, Kramer 0-2). Steals -- Punahou 3(Steinhoff 2, Toma), KS-Hawaii 2 (Kackley, Collins). Blocked shots -- Punahou 6 (Steinhoff 2, Crabb, 2, Hilliard, Teo), KS-Hawaii 0. Officials -- Pat Silva, Tony Colozo, Jose Irizzary. A--4,124.